Lrrr and Ndnd go through marriage difficulties. "Lrrreconcilable Ndndifferences" is the ninety-ninth episode of Futurama, the eleventh of the sixth production season and the eleventh of the seventh broadcast season. It aired on 26 August, 2010, on Comedy Central. It guest-stars Katee Sackhoff as Grrrl and Sergio Aragonés and Futurama creators Matt Groening and David X. Cohen as themselves. After a bungled Earth invasion, Omicronian leader Lrrr faces a mid-life crisis. In 2011, Maurice LaMarche won a Primetime Emmy Award for Outstanding Voice-Over Performance for voicing the roles of Lrrr and Orson Welles' head in this episode. 1.1 Act I: "I am Lrrr, ruler of the planet Omicron Persei 8!" 1.2 Act II: "I'll do it for free." 1.3 Act III: "She is not the boss of you. I am the boss of you!" Act I: "I am Lrrr, ruler of the planet Omicron Persei 8!" Stopping her husband watching The Scary Door, Ndnd becomes fed up with Lrrr's lack of motivation to conquer other worlds. He reluctantly invades Earth. However, he arrives during Comic-Con 3010 and is mistaken for a costume contest participant and leaves dejected. Concurrently, Fry attempts to author a superhero comic book featuring himself as the superhero saving a captured Leela from a malevolent alien. The crew is unimpressed with the comic, with the exception of the back page of novelty toy ads for X-Ray Specs, vomit, sea monkeys, and the Professor's disintegration guns, which are actually only teleportation guns. Leela also criticizes the comic, leaving Fry to figure out how to make the story more compelling. Back on Omicron Persei 8, Ndnd learns of Lrrr's failure and kicks him out of their home. Lrrr returns to Earth, seeking shelter at the Planet Express headquarters. Act II: "I'll do it for free." The crew diagnoses Lrrr and his marriage problems as symptomatic of a midlife crisis. Leela encourages Lrrr to recommit himself to his marriage with Ndnd, but he listens instead to Bender and gets horn extensions, flashy new clothes, and goes out to The Hip Joint to meet new women. There he meets an attractive female Omicronian named Grrrl. While on a date with her, she reveals that she is actually a human woman from the Comic-Con wearing an Omicronian costume. Though she is very attracted to real Omicronians, Lrrr rejects her and seeks Leela's advice on how to win back Ndnd. Fry and the crew help Lrrr stage an invasion of Earth using a fake broadcast with the help of Orson Welles' head à la the 1938 War of the Worlds radio broadcast. Ndnd is fooled, but so is Zapp Brannigan and the Earthican army, who immediately surrender Earth to Lrrr. Act III: "She is not the boss of you. I am the boss of you!" Leela scolds Lrrr, demanding that he end the charade and tell Ndnd the truth, but he hesitates due to Ndnd's renewed romantic interest and forces the citizens of Earth into slavery. During this time, Leela constantly nags Lrrr about telling Ndnd the truth, which causes Ndnd to become suspicious about their relationship. She confronts Lrrr, demanding to know if he is having an affair. Grrrl reappears, announcing that she loves Lrrr and will fight for him, brandishing a disintegration ray. Ndnd quickly takes the weapon and shoots Grrrl, causing her body to disappear. Ndnd reveals that she is not upset that Lrrr may have been minutely romantically involved with Grrrl, but that Lrrr allowed Leela to nag him, which Ndnd feels is her role and right as his wife. She invokes an Omicronian rite called Rrrmrrrmrrrfrrrmrrr or Consequences where Lrrr is reluctantly forced to prove his love for Ndnd by shooting Leela, whom he values as a friend, with the Farnsworth Novelty Disintegrator Ray. As he fires, Fry leaps in front of Leela, sacrificing his life. Ndnd is moved by Lrrr's demonstration of love and the two happily depart back to Omicron Persei 8. Leela is devastated by Fry's sacrifice. However, as the Omicronians depart, Grrrl reappears, shocking the crew. She reveals that the disintegration gun is merely one of the Professor's novelty teleportation guns that she purchased from an ad in the back of a comic book. She then begins to hit on Zoidberg who responds by saying of course he'll marry her. Realizing that Fry is alive, the crew find him back at Planet Express, putting the finishing touches on his comic. Inspired by his own heroic actions, his super hero counterpart attempts to rescue Leela from the malevolent alien by leaping in front of its ray gun. Leela is pleased with the new ending and commends the comic book, giving Fry a kiss on the cheek. In its original American broadcast, "Lrrreconcilable Ndndifferences" was viewed by an estimated 1.981 million households, a bounce of 200,000 viewers since "The Prisoner of Benda". The episode was given a rating of 9 out of 10 from IGN - an 'Outstanding'. On 14 July, 2011, Maurice LaMarche was nominated for Outstanding Voice-Over Performance for his performances as Lrrr and Orson Welles' head in this episode at the 63rd Primetime Emmy Awards. Orson Welles' head in the Head Museum, near Futurama voice actor Frank Welker. Once again, Maurice LaMarche reprises his Orson Welles impression and his parody of Welles' infamous "Frozen Peas" recording session, having previously reprised this impression for such diverse projects as the Brain in Pinky and the Brain and Welles himself in the film Ed Wood (although the physical incarnation of Welles was played by Vincent D'Onofrio) and the TV shows The Critic, Hey Arnold!, and The Simpsons. An actual "Delivery-Boy Man" comic, based on the events of this episode, was released as a promotional item at Comic Con 2010 a month prior to its airing. This is the second time that Fry jumps in the way of peril to save Leela. The heads of Frank Welker, Paul Weller, and H. G. Wells among others can be seen beside Orson Welles' head. This is the fifth time Matt Groening's head appears, previous times were "Space Pilot 3000", "Where No Fan Has Gone Before", Bender's Big Score and Into the Wild Green Yonder. Ndnd: I demand the ancient ritual of Rrrmrrrmrrrfrrrmrrr or Consequences! Bender: Let me put it like this: After I leave here, I'm getting a memory enema. Invader X: One more step and little Miss "constructive criticism" gets it! The episode's title is a reference to either the 1984 film Irreconcilable Differences or the legal term that the film is named after. 'Peace With Honor' was a phrase Nixon used to explain the US withdrawal from Vietnam near the end of the Vietnam War. Lrrr watches an episode of The Scary Door, which is a reference to The Twilight Zone. Orson Welles recreates his 1938 radio broadcast based on H. G. Wells' book The War of the Worlds. During the fake broadcast of an invasion, Orson Welles says, "We interrupt our program of the Jonas Brothers and their Orchestra...". A reference to the pop band, The Jonas Brothers and to Ramon Raquello and His Orchestra, which was 'interrupted' in the original "War Of The Worlds" radio broadcast. Lrrr brings back the face of J.J. Abrams, a famous movie director as well as the creator of Lost. Bender's phrase "Dork calling Orson" when Fry is calling Orson Wells is a reference to the 1978-1982 Robin Williams sitcom Mork & Mindy. The location of the Omicronian ancient ritual is White Planes, NNY: a reference to the city White Plains, NY. Ndnd's line "She is not the boss of you! I am the boss of you!" is a reference to the video game Zork: Grand Inquisitor. The Farnsworth Novelty Disintegrator Ray that is really a teleporter ray is similar to the transmat, from the science-fiction show Doctor Who. The Comic-Con sequence, for example this costume contest scene, is filled with references. Matt Groening's and David X. Cohen's heads' new show, Futurella, is a self-parody of Futurama, down to the same opening sequence and the fact that it was cancelled before its time. The people on the panel are the Futurama crew members that were on the 2010 Comic Con panel and the panel's moderator is based on Bill Morrison, who is their usual moderator. Princess Leia's slave outfit from Star Wars (some fat girl). The "Toy-minator" seen at 3010 Comic-Con is a reference to "The Terminator" franchise and the stars beside the name is a reference to the "G.I. Joe" toy franchise. The Zapp Brannigan action figures are modelled in the same pose as the actual Toynami figure, and the box is also of a similar design. His line refers to an outtake from the animated Star Trek series, where Shatner is asked to say the word "sabotage" differently, and tells the director "Don't tell me how to do it, it sickens me". At Comic-Con, between “Videogame – The Movie” and “Movie – The Videogame”, a racer very similar to the racers in Tron, the 1982 film turned video game, can be seen. Leela makes a reference to Joss Whedon, a Comic-Con fixture who is the creator of such projects as Buffy the Vampire Slayer, Firefly, Serenity, Dollhouse, and Dr. Horrible's Sing-Along Blog. When Matt Groening's head shoots Bender after he asks when a second Simpsons movie will be made, Bender can be heard shouting, "D'OH! ", which is, of course, Homer Simpson's catchphrase. When Fry is talking to Sergio Aragonés' head, Aragonés says that he likes the tiny doodles in the margins. Aragonés draws little "marginals" for Mad Magazine, which are printed between panels. Lrrr watches an episode of The Scary Door, previously seen in many other episodes, most recently Bender's Game. Lrrr's and Ndnd's relationship problems were previously established in "Spanish Fry". At Comic-Con 3010, Lrrr states that he recognizes Leela from somewhere; in response, Leela says that she was in his mouth at one time. A reference to the event in "The Problem with Popplers". There are people dressed up as Mom and her three sons. Grrrl is dressed up as Edna, Zoidberg's love, from "Why Must I Be A Crustacean In Love". There's someone dressed up as Yivo from The Beast with a Billion Backs. There's someone dressed up as the Robot Devil. There are Dwight along his Chinese and Indian friend dressed up as members of the brain spawn last seen in "The Why of Fry". The cross-species dresser uses the word Popplers in this episode, which has not been heard since its premiere in "The Problem with Popplers". The army, led by Zapp Brannigan before surrendering to Lrrr, are wearing the same army uniforms seen since "War Is the H-Word". Bender uses his left eye as a broadcasting camera once again, which he used previously in "When Aliens Attack". Professor Farnsworth uses his Fing-longer to wake up Lrrr; the Fing-longer was introduced in "Anthology of Interest I" and has been seen most recently in "The Duh-Vinci Code". As a continuation of a running gag established in "When Aliens Attack", Lrrr once again has trouble speaking into a microphone. The “Spaceship in a bottle” on display at the Comic-Con is not unlike Professor Farnsworth's scale model of the universe's largest bottle with a spaceship inside, as seen in "The 30% Iron Chef". Lrrr buys his car from Malfunctioning Eddie's Rocket Car Emporium which was first seen in "Put Your Head on My Shoulders". The Hip Joint, a night club, has previously been seen in several episodes. The Australian man has once again been enslaved, after being enslaved in the episodes "How Hermes Requisitioned His Groove Back" and "A Pharaoh to Remember". Ndnd watches the live "Earth Invasion" broadcast in real time, despite Omicron Persei 8 being 1000 light years away from Earth. This delay in signal reception was an integral plot point in the episode "When Aliens Attack", when Lrrr travels to Earth demanding resolution to the unfinished episode of Single Female Lawyer, that had aired on Earth 1000 years prior. It was established, however, in "A Clone of My Own" and the episodes' commentaries, that more recent broadcasts travel at the new, faster, speed of light. Lrrr is seen driving his 3011 Thundercougarfalconbird in "Fry Am the Egg Man". At The Elegant Elephant, Lrrr shoots the salesman with his lasergun, but in the mirror his arm moves slightly earlier than the actual one. When Lrrr and Bender go to The Hip Joint, Grrrl asks "Hey, cool cape, wheredja get that?" and Lrrr responds "What, this old thing? I murdered my father." However, Lrrr's cape is extremely similar, if not identical, to the one he has worn throughout the series. He may have actually killed his father, who was last seen in Into the Wild Green Yonder, and acquired an identical cape accordingly. His claim might have been an outright lie, as an attempt to impress Grrrl. When they are broadcasting live, they are in the Planet Express building and then suddenly by the White House. The fact no one remembers that the Earth was attacked by Brain Spawns doesn't mean that people are completely unaware of their existence. Since some time has passed, their openness regarding the matter may have changed. 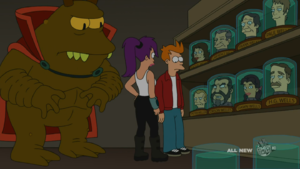 When Leela tries to persuade Lrrr to avoid another War of the Worlds, just before Fry calls Orson Welles, Lrrr's horns are the same colour as the rest of his skin. When Lrrr shoots the robot in the clothing store, his "LRRR" necklace is legible in the mirror, when it should be reversed, and his reflection puts away its gun before he does. According to the episode "When Aliens Attack", Omicron Persei 8 is 1000 light years away so shows are 1000 years late yet Ndnd sees the broadcast. That only pertains to old 20th-century broadcasts and not something of that time's standards which are specifically being transmitted toward the planet. This corroborates with Professor Farnsworth's claim in "A Clone of My Own" that the speed of light was changed in 2208. ^ Robert Canning (27 August 2010). Futurama: "Lrrreconcilable Ndndifferences" Review. (IGN.) Retrieved on 23 October 2010. ^ See also Star Trek. This page was last edited on 1 February 2018, at 18:35.